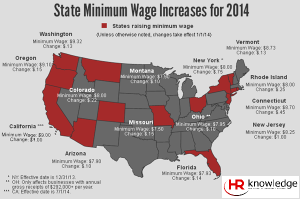 As we prepare for your first payrolls of 2014, we would like to make you aware of state minimum hourly wage changes that took effect on January 1, 2014 unless otherwise noted below. If you are a multi-state employer with operations outside of Massachusetts, it is important to know that many states provide annual increases to the State Minimum Wage based on the U.S. Consumer Price Index and inflation. Under the Fair Labor Standards Act (FLSA), the current federal minimum wage is $7.25 per hour. However, because the FLSA does not supersede any state or local laws that are more favorable to employees, if a state has a minimum wage that is higher than the federal minimum, employers subject to the state minimum wage law are obligated to pay the higher rate to employees working in that state. Click here for a map that shows the states that have increased their minimum wages, including the new rate and amount of the increase. Certain localities also have implemented minimum wage legislation. For example, in San Francisco, the minimum wage increased on Jan. 1 from $10.55 to $10.74 an hour, and San Jose, California, increased its minimum wage from $10 to $10.15 an hour. (California law does not allow employers to take a tip credit against minimum wage for tipped employees.) In addition, the Albuquerque, New Mexico minimum wage increased from $8.50 to $8.60 effective Jan. 1. However, the minimum wage in Albuquerque is $7.60 if an employer provides healthcare and/or childcare benefits to the employee during any pay period and the employer pays an amount for these benefits equal to or in excess of an annualized cost of $2,500. Minimum wage for tipped employees increased from $3.83 to $5.16. Clients should inform your HR Knowledge Client Account Manager of any employees’ hourly rates that need to be changed to meet the new state minimum wage requirements as we must provide the new rate to ADP with the first payrolls with a check date on or after January 1, 2014 (and December 31, 2013 for NY). If you operate in a state that has an increase effective January 1, 2014, order the Peel-N-Post overlay ($8.95) OR the most recent version of our All-in-One poster ($49.99 + shipping) by contacting HR@HRKnowledge.com.